Do you need help with your heating or cooling system? Need a new thermostat or zoning product? What if the quality of your indoor air is so poor it’s making you ill? 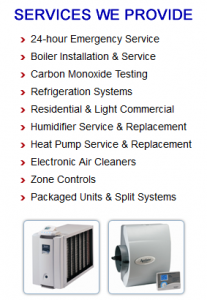 AM/PM Heating and Cooling Service has a number of Carrier products that can meet all of these needs. Our factory-trained technicians are among some of the best in the heating and cooling industry, and they’re standing by to help you with repairs, preventative maintenance, and installation. Your heating and cooling system is vital to your home. It probably consumes the most energy out of all your home appliances. According to studies, heating and cooling buildings consumes more than a third of all energy in the U.S. Improperly installed or operating furnaces or air conditioners can use much more energy, driving your utility bills up. That’s why it’s important your system is installed and maintained by skilled professionals. Free consultation at your home with an HVAC specialist. Help with selecting the best and most energy-efficient heating/cooling system for your family and your home. Selecting and sizing of the right equipment for your home and its unique needs. Flexible financing that gives you convenient ways of paying for installation. Complete factory warranties for all installed equipment and our labor. Your furnace and central air conditioning system are huge energy draws, especially if they’re poorly designed, aren’t right for your size home, or haven’t been maintained properly. With these systems using a third of all power in the country, it’s very important that your home has the proper equipment. Otherwise, you may find yourself paying much more than necessary to warm and cool your house. Complimentary consultation at your home or business with an HVAC specialist. Assistance with selecting the best heating/cooling system that fits your comfort preferences, building size, and lifestyle. Sizing all equipment so that it meets your homes unique design and needs. Assisting with payment via our versatile financing packages. Providing full warranties for all installed equipment and performed labor. Our team of specialists and licensed contractors are experts in air-conditioning and heating. We have all the necessary equipment, tools, and experience needed to keep all of your equipment well-maintained and functioning. Got an emergency? We offer emergency services 24/7. We also have service agreements that can help keep your comfort systems working at peak efficiency so you have fewer emergencies. To keep your systems running at their best and prevent little issues from turning into major problems, we provide regular maintenance and annual service agreements. By purchasing an annual agreement, you’ll save on the various tune-ups and adjustments you may need throughout the year. Protect the investment you’d made in your home. It seems like your furnace or air conditioner will be working fine until the temperature turns extreme. Suddenly, it’s below zero and you need a heater repair service right away! One way of minimizing these emergencies is to have your system regularly checked. These small maintenance visits can keep everything working longer, although no amount of maintenance will stop the wear and tear of a system that’s in use for years. What does our service agreement offer? For more details regarding a service agreement, contact us. In addition to the single-year contract, we offer discounts for multiple years and can recommend which program fits your needs the best. An extended warranty gives our customers another way of keeping their costs in line with their budget. While other equipment and appliances may not need as regular of service, your heating and air system work all year round, so they will need more upkeep. Why should you have an extended warranty for your equipment and all labor? It helps you estimate your costs while protecting yourself from an increase in either labor or parts. While a factory warranty can help, they usually expire before your equipment will need to be replaced. An extended warranty will cover any extra costs, such as labor, during the coverage period. It lets you relax since you know your equipment will be covered in an emergency. Speak to our specialists today about what an extended warranty can do for you and if one is available for your equipment.